The week continued to be a smashing one at Earls Hall. The morning started with Mrs Critoph leading the KS1 assembly where she was joined by her recorder group. the children played for the rest of the children and Mrs Critoph explained how by practising the instrument and learning from their mistakes they are getting better and better each week. Well done to all of the children who played, we are proud of you. Later in the day the children in Year Two looked a various sentences and identified which ones were commands, explanations or questions in groups. In the hall the children also took part in a PE lesson which saw them moving up, along, off and over various apparatus with increasing skill! After school we were joined by the team from ‘Essex Reptile encounters’ for another session of ‘Reptile club’. 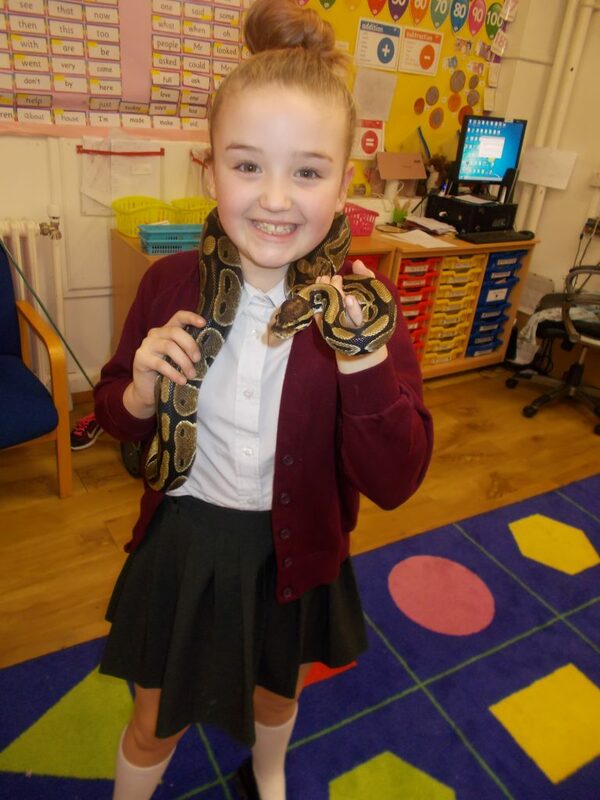 today the children investigated a range of snakes, getting up and close and personal with them whilst learning all about their habitats, habits and diet.